Difficult Conversations as a Catalyst for Change is a semi-annual event where presenters strive to broaden the perspectives of our students, faculty, staff, alumni, and friends. In sharing our ideas and allowing ourselves to be challenged and changed, we can all achieve greater insight into the problems we share as citizens of the world in the 21st century. The theme focuses on the idea that driving all progress—whether cultural, technological, scientific, or aesthetic—is the free give and take of differing viewpoints. We only learn, grow, innovate, and discover through encounters with difference. In this series of events, the dean of the faculty of Arts, Sciences and Engineering (AS&E) will bring to campus thought leaders, innovators, and iconoclasts who seek to live and achieve the Rochester ethos of “Meliora,” or ever better. 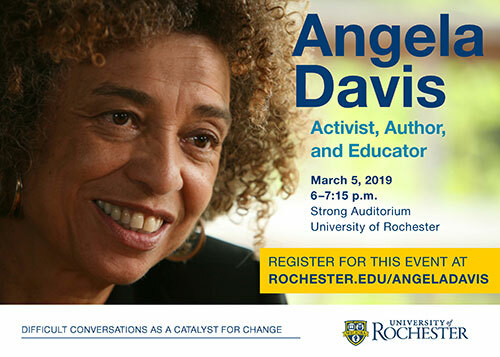 Scholar and political activist Angela Davis presents a free lecture at 6 p.m. Tuesday, March 5, in the Feldman Ballroom, Douglass Commons. “As the next speaker in our Difficult Conversations as a Catalyst for Change series, [Davis] is uniquely poised to speak about how universities can equip students to become engaged citizens of the world, where disagreements abound but common cause can be found around the need for respectful dialogue across differences,” says Donald Hall, the Robert L. Mary Sproull Dean of the Faculty of Arts, Sciences & Engineering. Watch Donald Hall's video message. In the first of an ongoing initiative to bring challenging conversations to campus, Donald Hall, the Robert L. and Mary L. Sproull dean of the faculty of Arts, Sciences & Engineering, welcomed basketball icon and activist Kareem Abdul Jabbar to meet with students and host a talk on the issues dividing America, including racism, economic inequality, and social injustice. For more information see the Writings on the Wall event page.